It is the time of the year when SC Ski Club Ranspach is going to Ramsau for a training camp. I am usually joining them, but this year I have to stay home. It is just too early for me to do cross country skiing. I am now riding my bike for about 2 hours a day. More is not allowed. 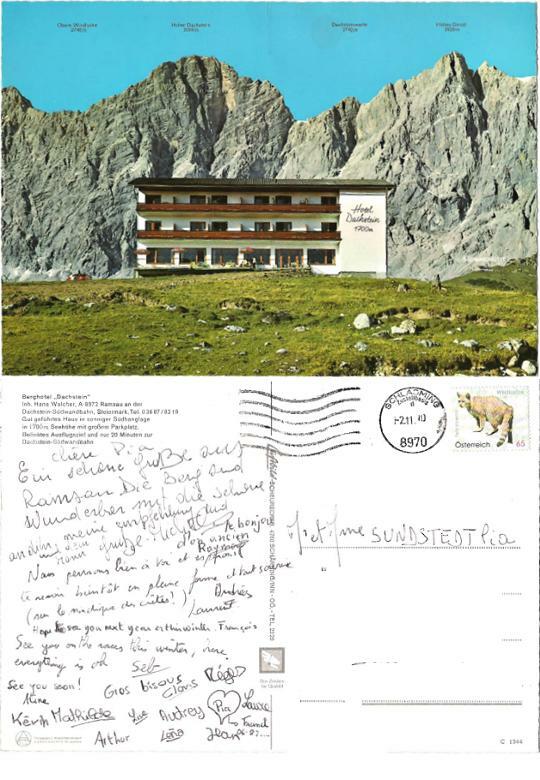 Today when I came from my training ride I was so happy to find a postcard from my team mates who are in Ramsau. I was such a lovely gesture from them to remember me and think of me now when I sit here home and wait for the day when normal training will be possible. For one week the skiers are up early in the morning to catch the first cable car up to the top of Dachstein. They take the cable car down for lunch and go up again for the second training session in the afternoon. Andre Grob ist the president and trainier of the club and has a lot of experience about training and racing. The youngsters are learning that a lot of work is needed if they want to become successful skiers. Now wonder that the club is one of the most successful ones on France, both in junior and elite classes.